One military man had something up his sleeve when he showed up at Jack Allen’s Kitchen in Austin, disguised as a waiter. What was he up to? In February 2016, Corporal Cory Harris returned home after serving with the United States Marine Corps in Japan for 14 months. Once back in Austin, Texas, he didn’t rush straight home to visit his dad, who had been missing him dearly. Instead, he went to Jack Allen’s Kitchen, asking them for a waiter’s uniform. What was Cory planning to do? Well … when his dad, Greg Harris, headed to Jack Allen’s Kitchen for a meal, he got down to work. At Jack Allen’s Kitchen, Greg was looking through the menu, wondering what to order. 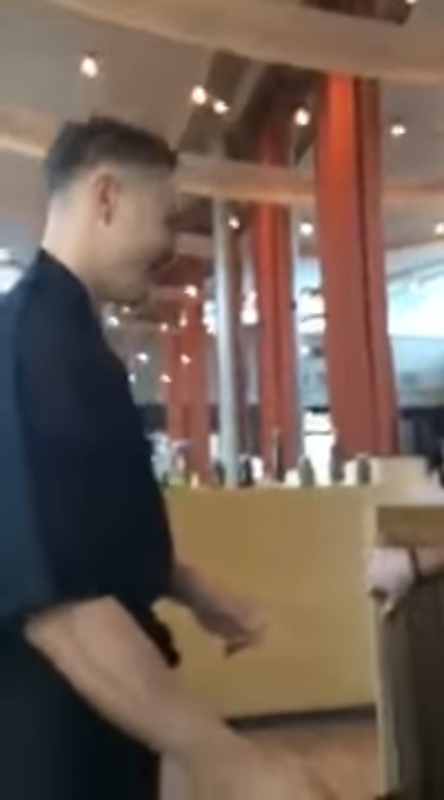 Out of the blue, a “waiter” with a familiar voice came over to take his order. When Greg looked up, lo and behold, Cory was standing in front of him, wearing a waiter’s uniform! Cory’s father recognized his son before the young man could read the short speech he had prepared. Completely taken aback by the surprise, Greg gasped in disbelief. 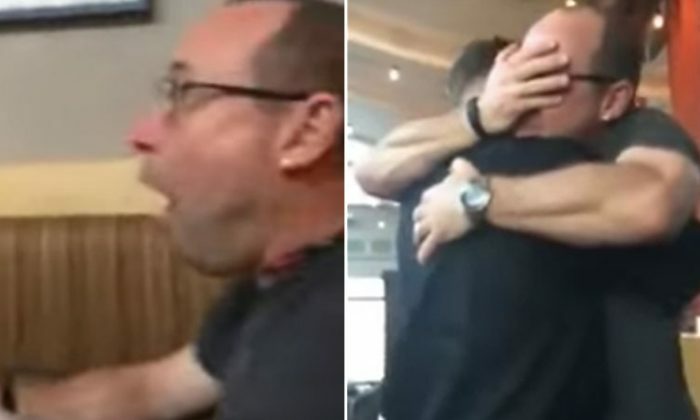 The ecstatic dad instantly dived around the table to give his son a warm hug. In the end, Greg took off his glasses and buried his face in Cory’s shoulder to shed tears of joy. The father’s love for his son was palpable. This surprise homecoming, caught on video, has been making rounds on the internet. “A loving father will not hesitate to show a lot of emotion when reuniting with his son. 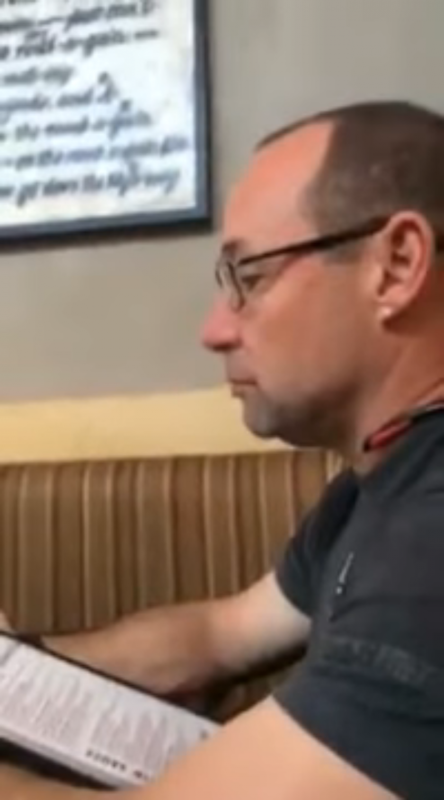 The father’s body language says ‘I love you and I’m proud of you,’” one YouTube user wrote. Definitely missing the good times. “Pure joy to see his boy. Awesome,” commented another. Having a military son deployed overseas can be difficult for parents who constantly worry about his safety. Hence, the best moment for any parent is undoubtedly when they see their son return home safely. 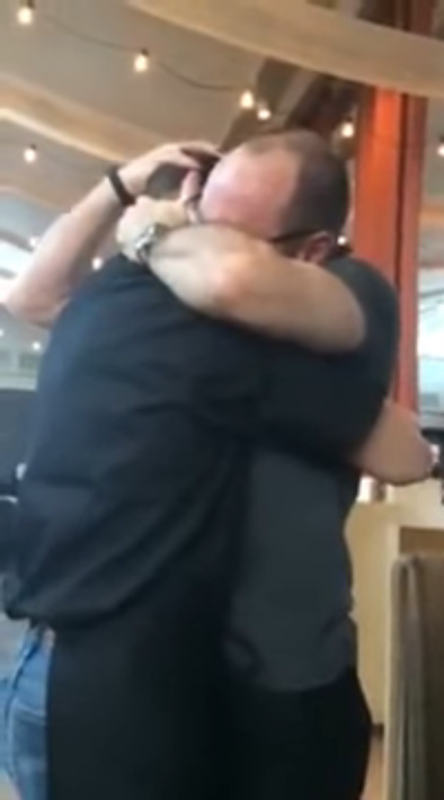 Check out the emotional reunion taking place at Jack Allen’s Kitchen in the clip.